WASHINGTON (CNN) -- The United States is moving the aircraft carrier USS Theodore Roosevelt to the Adriatic Sea to bring it within striking range of targets in the former Yugoslavia. According to Navy sources, the ship, which is moving from the Mediterranean, should be on station and within striking distance by Tuesday evening, Washington time. 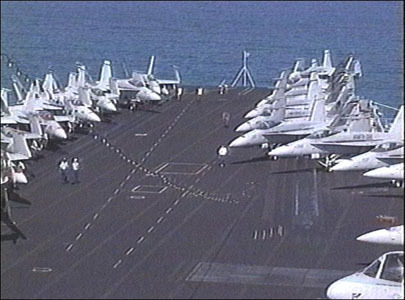 The Roosevelt has more than 50 combat planes aboard, including 36 F/A-18's, 14 F-14's. The Pentagon said the move should be interpreted as a "prudent step" in light of existing tensions in the aftermath of Monday's shelling of a civilian marketplace. The request for the move reportedly came from U.S. Adm. Leighton Smith. A stop at the island of Rhodes planned for the ship Tuesday was canceled. In other news, the United Nations has pulled the remaining peacekeepers from the eastern enclave of Gorazde in Bosnia- Herzegovina. The move is an effort to prevent Bosnian Serbs from taking U.N. troops hostage and using them as human shields against possible NATO air strikes. Only two unarmed military observers remain in the U.N.-declared safe haven. As the Sarajevo morgue filled with bodies, U.N. and NATO officials continued coordinating a retaliatory response against the Serbs. A lengthy chain of command and fears of Serb reprisals against U.N. troops are slowing the decision- making process.